The project aims at viewing an interactive map of Public Transport of Victoria (PTV). 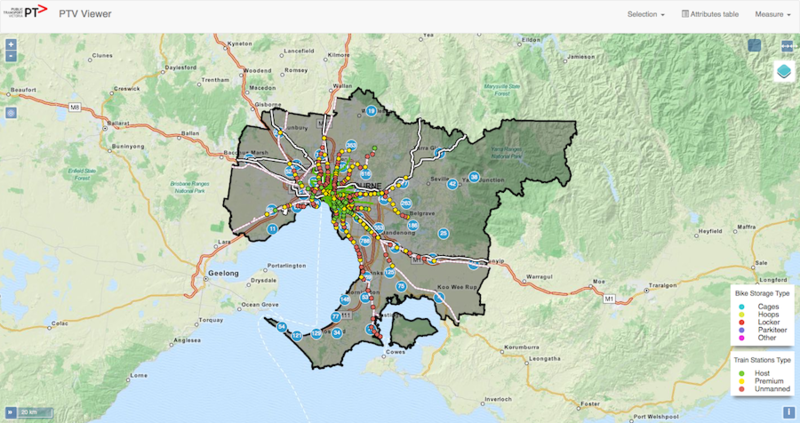 This is a desktop and mobile compatible hybrid web-mapping application for Melbourne region where the users can view and query the PTV data such as bike storage sites, bus, train and tram stops and routes, train car parks etc. Users can query the app. for example to find out what type of bike storage such as cage, hoops, lockers or parkiteers exist and at which all stations. Interactive maps enables users to click on the routes for example bus routes to all the information on that route specific data such as the bus no., stops etc. Features on the maps can be selected using hand drawn polygon or by rectangle, circle etc to select the different features in the layers. Also measurements like distance and areas can be calculated on the map for purpose of decision making.